Two unique scrapers from the middle Neolithic? Hafted scrapers are typically unifacial (flaked on one side),made from flakes or blades of flint, that were then fixed or ”hafted” to a handle and used to scrape excess fat and flesh from animal hides as a part of the tanning process. I came across one such hafted scraper with an unusual form which triggered a memory of a similar one which was recovered in my trench, trench A, where I was a student dig supervisor in the Spring of 2011 on an archaeological dig in Korsnäs, Grödinge Parish, a Pitted Ware site south of Stockholm. The scraper in question, SHM 34984:x220/y424 F8, is essentially spoon shaped, with a long narrow stem, pronounced steep shoulders, and a broad convex cutting/scraping edge. It was made from a blade. Its dimensions are 39mmx 23mm. Both SHM 34984:x220/y424 F8 and the scraper uncovered in my trench in Korsnäs, F183, are made from blades, and look largely similar in form and construction to an oversized stemmed arrowhead with a blunted tip (and could in fact be made from salvaged projectile points). 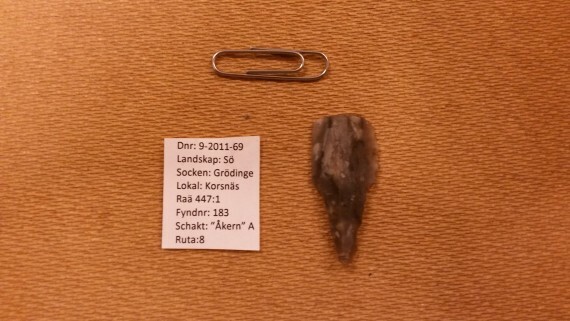 Since both artifact types were made using a blade technique, it is likely that smaller blades were selected for arrowheads, and larger blades for scrapers/spears. 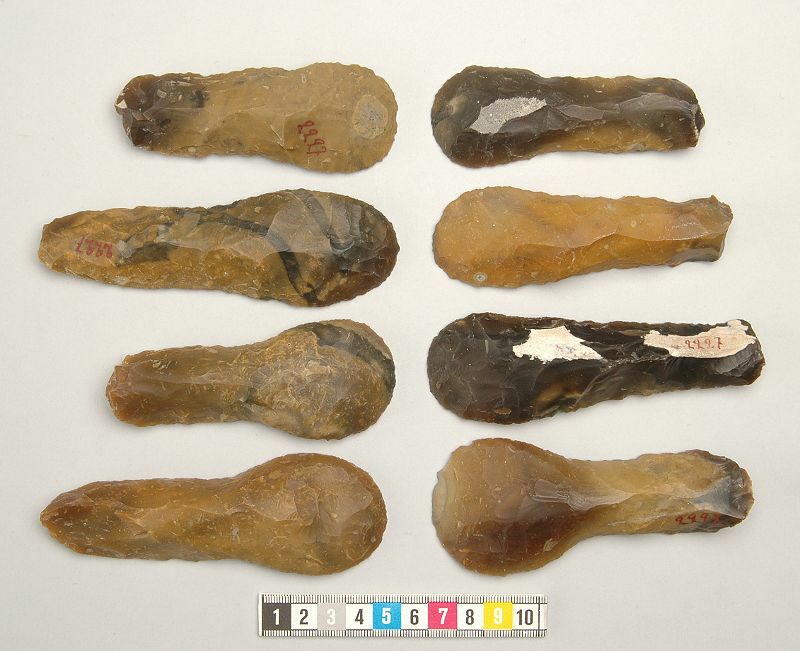 Spoon shaped scrapers are known from the late Neolithic, but these are larger and typically fully unifacially flaked from large flakes. 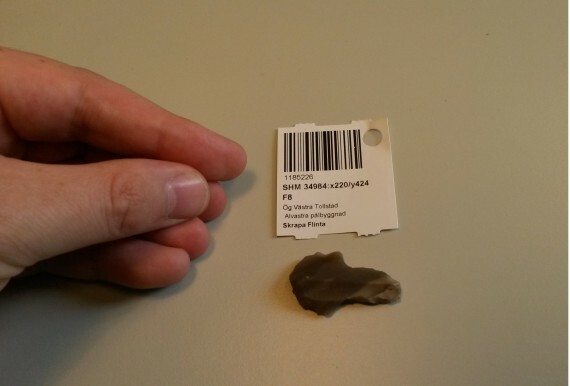 They also are morphologically different as due to their large size, their stems functioned as handles themselves, rather than likely being hafted, like the smaller, middle Neolithic examples from Korsnäs and Alvastra. It is currently unclear whether or not there is any sort of developmental connection between these two morphologically similar scraper types from consecutive time periods. Thank you for following us! We are happy you find it interesting.